The AppStudio Server Debugger is needed to debug iOS native apps (made with PhoneGap) on Windows. In AppStudio, go into the Project Properties for your project. Set "Debugger" to True. Use "Build Native App with PhoneGap" on AppStudio's Run menu. Once the build is complete, download your app and start it on your device. Select "AppStudio Server Debugger" on AppStudio's Run menu. You need to do this with the app loaded, so it can look for the same app on the device. This screen identifies the current session. The device needs to have an active WiFi connection to communicate with the PhoneGap's debug server. Your desktop is logged into that same server to get the information from the device. 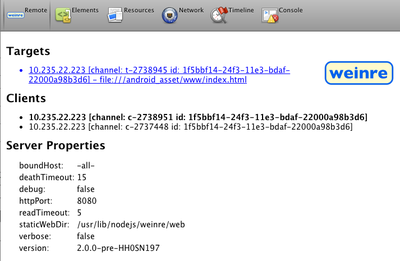 The Console tab works very much like the Console tab on the Chrome debugger. Use this to view error messages and enter console commands. Since commands you type are sent to PhoneGap's debug server and then on to the device, it can take a few seconds to get the result of something you type. The Elements tab shows the elements and scripts of the app. The Resources tab lets you look at values in localStorage and databases. This page was last edited on 3 May 2017, at 12:27.